I’ve written about my plan for a layout based on the Harrogate gas works before, and given it quite a lot of thought, but when you actually start shuffling track around on a board it starts to feel a lot more like a project. So what you see above is the more-or-less final trackplan, laid out on an A1 foamboard sheet. The layout won’t actually be this shape, on the left the edge is more likely to be a vertical line down from the top corner. From the toe of the turnout at the top the line will curve back on itself into a tunnel and end in a cassette fiddle yard of some sort behind the scenery. 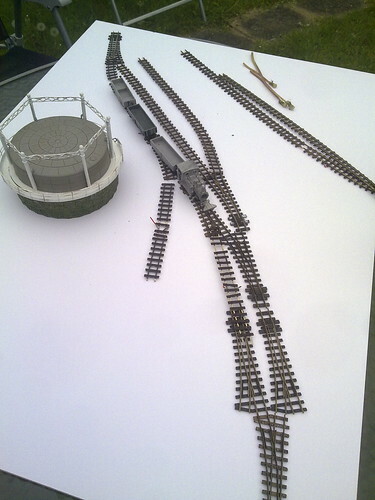 At the bottom, there needs to be a short extension for the trio of coal drop sidings and the shed they run in to. The gas holder was a complete impulse purchase, I didn’t even know such a product existed, but on inspection of the box I see the Hornby range also includes a retort house, boiler room and other gas works structures. Strictly speaking the works at Harrogate was across the road beyond the bottom of the photo but I think the holder and maybe a couple of other bits will help to set the scene. After all I am maintaining the whole thing is “based on”. By the end of this afternoon’s track shuffling it had taken on a position just below the end of the engine shed siding in the middle of the photo. All up I am hoping it will still fit within the roughly 5′ length I originally planned. It’s going to be mostly foamboard with a ply skin – Chris Nevard’s Catcott Burtle has shown that a layout of this size is feasible in the material. Whether it ends up being in one lump or two will depend on what fits in the car! This entry was posted in 009, harrogate, industrial, layout, model railways, narrow gauge, planning, track plans. Bookmark the permalink. I don't think I've seen so many points in such a small space before! I shall be following your progress with interest!